With the World Cup having commenced and sun shining brightly we decided we got to do something to entice our customers to spend a little bit of time on the computer. 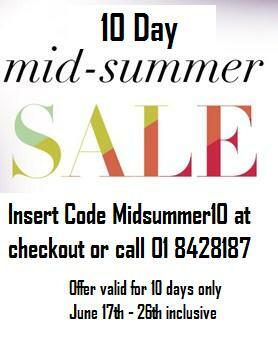 For the next 10 days you can all avail off a 10% discount across the entire Purchase.ie product range. To avail of this offer all you got to do is insert the discount coupon code Midsummer10 at checkout when ordering online. Alternatively call us in Dublin on 01 8428187 and quote the code and we will process your discounted order over the phone. With over 350 products now to choose from its surely worth a browse through our range. Browse the Purchase.ie shop section now.